Bangladesh Tea Board Job Circular 2018 has been published by the government Tea Board of Bangladesh. 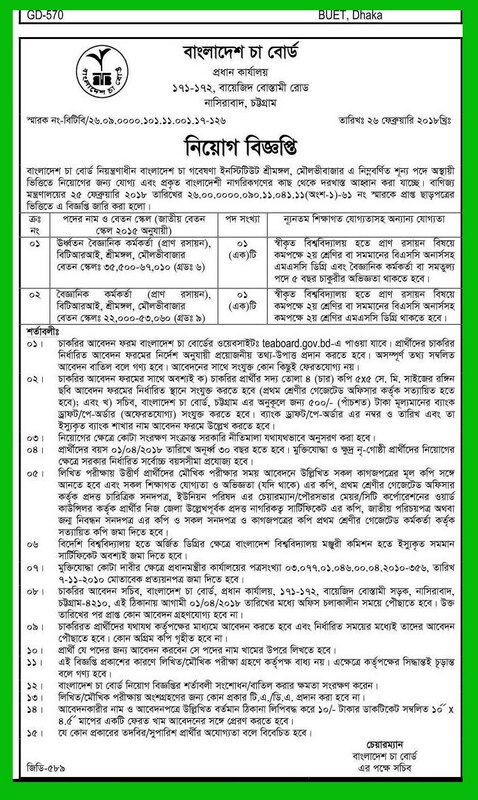 The application of Bangladesh Tea Board Job Circular 2018 has been started on Feb 2018 See the full circular of the circular from their official website at http://teaboard.portal.gov.bd. Like our Facebook Page to get regular updated at www.facebook.com/dailybestjob. Bangladesh Tea Board, Chittagong has offered a job circular where they want a few peoples as their working stuff. So to get more upcoming job news in the Bangladesh Tea Board, Chittagong keep following the circular then apply as early as possible according their circulation. The circular has given below for you guys.